This is a follow-up to my previous post, Vancouver: An Overview. In it I gave a rundown of a variety of attractions in the city of Vancouver proper. Today I continue with a list of things visitors to Vancouver may find interesting in the suburbs. And I am using the term loosely to refer to the panoply of towns and cities stretching from Harrison Hot Springs in the east to Squamish in the west. This is hardly an exhaustive listing simply because there are too many to cover them all and I don’t even know of them all. This is based mainly on my personal experience or what I have heard from others. Harrison Hot Springs is about an hour and a half east of downtown Vancouver nestled beside beautiful Harrison Lake. It is a popular site for boating and just walking along the waterfront. You can take a boat excursion of the lake or rent your own boat if you like. As the name suggests, there is a local hot springs nearby and the town has a public swimming pool which has hot water pumped in from the hot springs. There are a variety of hotel, gift shops and restaurants as well. Harrison Mills is a tiny farming community about twenty minutes from Harrison Hot Springs but with some interesting attractions for the visitor to Vancouver. 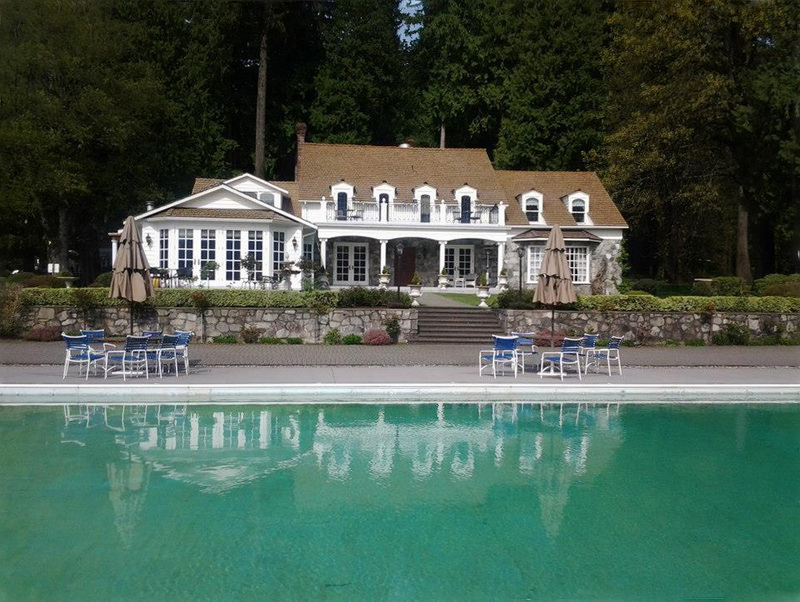 These include Rowena’s on the River, the old homestead of a wealthy lumber baron that was turned into an inn by his children. The inn hosted a Great Gatsby Party a few years ago which I wrote about here. This year they are hosting a Harvest Moon Longtable Dinner on September 16th. Dining under the stars. The inn is also adjacent to the Sandpiper Golf Course. And in mid-November it hosts the annual Bald Eagle Festival as majestic birds visit the river estuary to feast on spawning salmon. Not surprisingly then, another attraction near Harrison Mills is the Weaver Creek Salmon Spawning Channel. The channel is open to visitors during salmon spawning season from October 6 to Nov. 1. Peak activity is from October 15-20. And another attraction nearby is the Hemlock Valley Ski Resort. Mission is a small town on the north shore of the Fraser River about an hour from Vancouver. It has two attractions I know of worth a visit. The most famous is Westminster Abbey, a benedictine monastery. Built in 1954, the site includes an abbey, a church and a seminary. It sits high on a hill and is notable for its distinctive steeple which can be seen for miles around. The second attraction of note in Mission is Cascade Falls, a remote wilderness park that I wrote about in a previous post. Abbotsford is the town where I live so I have a particular affection for ir and familiarity with its attractions. It is known as the City in the Country and has a lot of rolling farmland including many berry farms – blueberries and raspberries are big. And it has some wineries as well. The town abounds with walking trails – the Trans-Canada Trail runs for about twenty kilometres along the shore of the Fraser River. The Discovery Trail crosses the city and includes three lakes known as Fishtrap Creek. Mill Lake is also a favorite hiking location. And for the more energetic there is the Abbotsford Grind, a hike up Sumas Mountain. In the Spring, you’ll want to catch the Abbotsford Tulip Festival which I wrote about when it debuted in 2016. 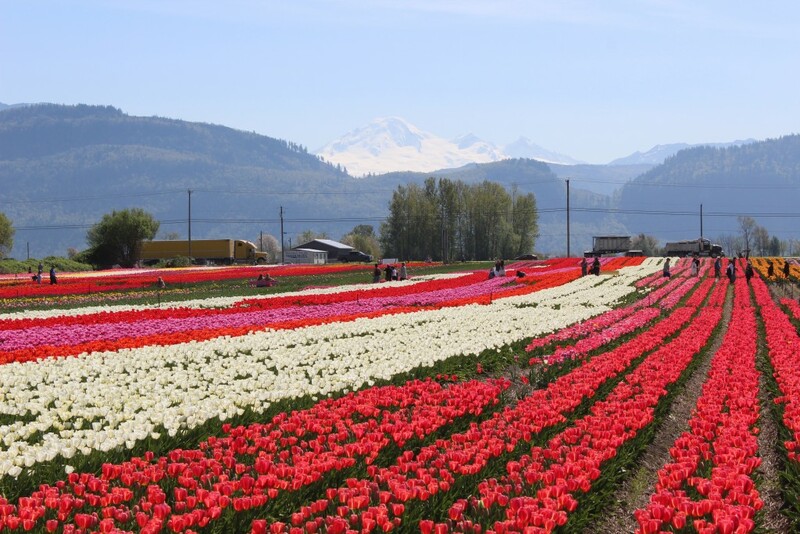 Mount Baker forms a great backdrop to the tulip fields. And every August the city is host to the annual world-renowned Abbotsford International Airshow. Fort Langley is a nice little village steeped in history. The main attraction is the old fort, a wooden stockade with many artifacts and employees in period costume demonstrating some of the trades and crafts of a bygone era. The town itself is known for its many antique shops and boutiques as well as some nice restaurants. White Rock is a town adjacent to the border with the United States. The famous Peace Arch is here. White Rock also has a fine beach with a long pier where you’ll often see fishermen and crabbers. The boulevard running beside the beach front area is lined with small shops and restaurants. It is a popular dining locale with its seascape views and ocean breezes. Richmond is a community immediately to the south of Vancouver and home to the Vancouver International Airport. 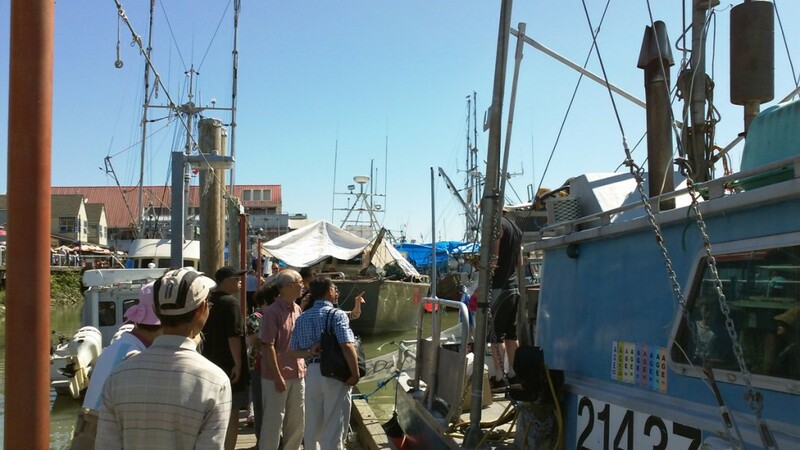 Its most notable attraction is the Steveston Fisherman’s Wharf. Steveston is an old community and used to be home to a major salmon canning operation. The former cannery is now a fishing industry museum. Walking along the Steveston dock you’ll find many restaurants and small shops. And you’ll find fishmongers selling their wares from the boats tethered there. Walk into the village and you’ll find a bakery, a garden shop, an ice cream parlour and other interesting shops. A short drive away is Garry Point Park. This park sits at the mouth of the Fraser River and is noted for its windiness and the many kite flyers that like to hang out there. Directly across the river from Steveston is the Reifel Refuge, officially the George C. Reifel Migratory Bird Sanctuary. This is a great park to walk around in and observe a wide variety of waterfowl. Almost 300 species of bird have been seen here. Of particular interest are the annual flocks of snow geese, magnificent white birds that stop here on their migration from Wrangel Island in Russia. These birds usually start arriving in early October. The main attraction in New Westminster is the Westminster Quay. Its large boardwalk overlooks the Fraser River. The site is home to a large farmer’s market as well as a number of excellent restaurants. You can also visit an historic paddle-wheeler. Always a fun outing. Burnaby is the city directly east of Vancouver and is known for the large Metrotown Shopping Mall and the iconic Telus building as well as a number of fine parks. But for visitors, your best bet is a museum. The Burnaby Village Museum is a recreated period village that displays life in colonial times. Craft shops and restaurants are part of the mix. You’ll also find a restored 1912 carousel. The people working in the village are all dressed in period costumes. The village is a delight for young and old alike. North Vancouver is home to numerous attractions. Set in the mountains on the north shore of the Burrard Inlet, it can be reached by the Lions Gate Bridge at one end and by the Ironworkers Memorial Bridge at the other end. 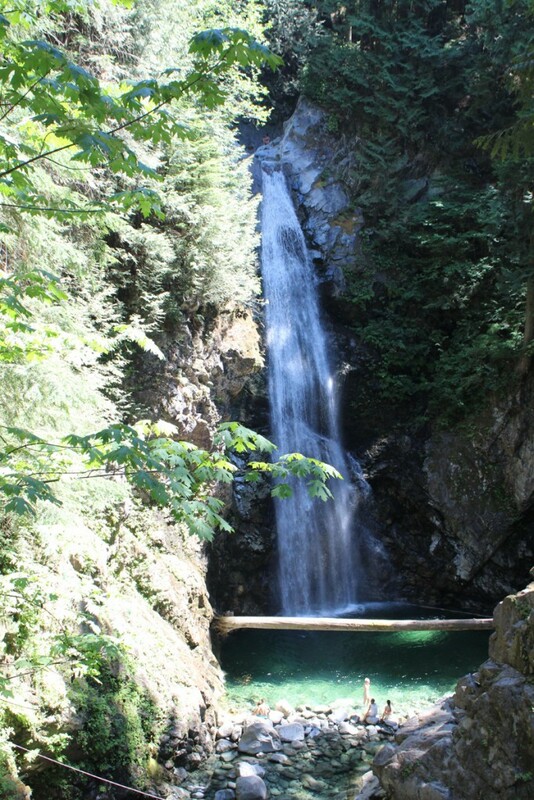 Lynn Canyon Park – this beautiful park features a number of trails through a natural setting of tall evergreens, hilly landscapes, and a raging creek. To get to the main park area you cross Lynn Creek on a rickety suspension bridge that soars high above the creek bed. Lynn Creek emerges from a narrow canyon to the north into a wide pool where locals often like to swim and to dive off the cliffs. Meandering down an increasingly rocky bed, the stream picks up speed as it cascades over several waterfalls. Unfortunately, a number of people have tempted fate and drowned here. Trails take you to a lower bridge where you can cross back to the parking lot and concession stands. Lynn Creek is a must see in my book. And it’s free! Capilano Canyon Suspension Bridge – this bridge over the Capilano River is a major tourist attraction. Besides the suspension bridge over the river, there is a walkway that overhangs the river. And there is a treetop adventure – elevated walkways between the trees. This is a private facility and an admission fee is charged. Grouse Mountain – in the winter Grouse is known as a mecca for local skiers. But even in the summer, there are activities aplenty, from hiking to live shows – a timber show and a birds of prey show. You can take the chairlift to the top and see the wind turbine at the peak. There is also ziplining and a number of restaurants. And did I mention the grizzly bears? I wrote about Grouse in the summer in a previous blog post. 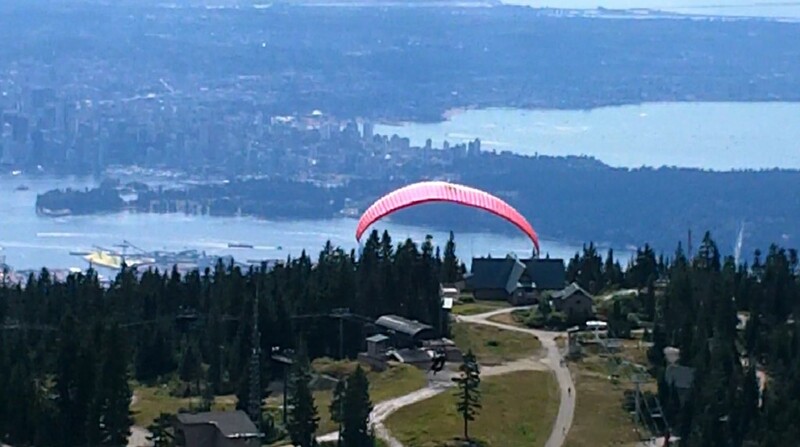 Hang gliders soar from the peak of Grouse Mountain in the summer. Cleveland Dam – this dam holds back the Capilano Reservoir which supplies much of Vancouver’s water. Lonsdale Quay – a large public market with many fresh farm produce shops, meat and fish markets and more. Similar to Granville Island Public Market and Westminster Quay. Lonsdale Quay is also a terminus for the Seabus, a passenger ferry running between North Vancouver and downtown Vancouver. 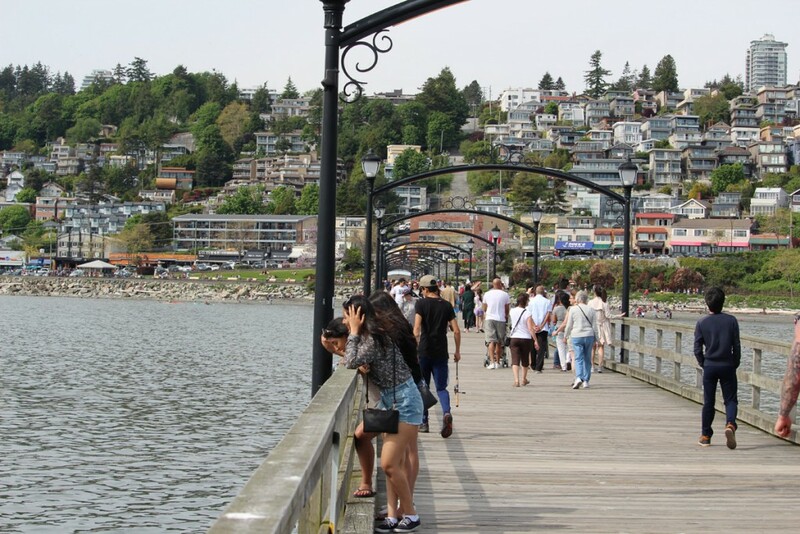 West Vancouver is home to a couple of nice nature parks, most notably Lighthouse Park and Whytecliff Park. It is also home to the Cypress Bowl ski area. Squamish is a small town located about an hour’s drive from downtown Vancouver. It is nestled at the end of Howe Sound. The Sea to Sky Highway that takes you there passes the Britannia Beach Mining Museum, a former copper mine. Close to Squamish is a triple attraction, three places worth checking out and all within walking distance of each other. 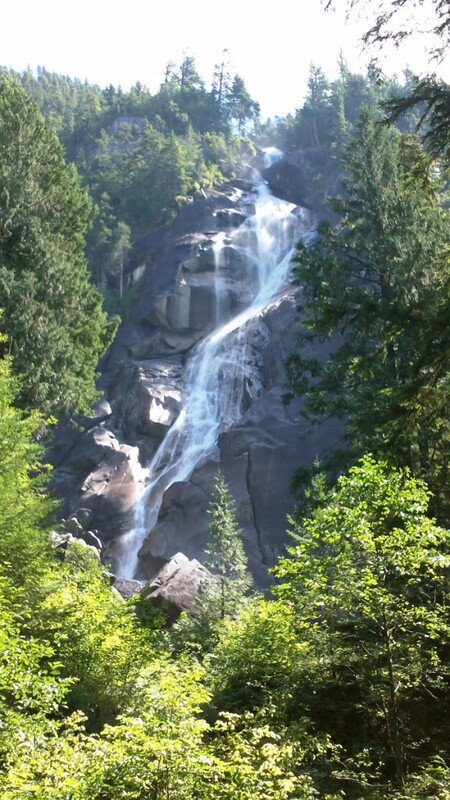 First is the thousand foot high Shannon Falls. This is a graceful airy cataract with wisps of spray catching the wind on the way down. You can easily walk right up to the base of the falls. A short walk away is the Sea to Sky Gondola which takes you to the lower summit of Mount Habrich. 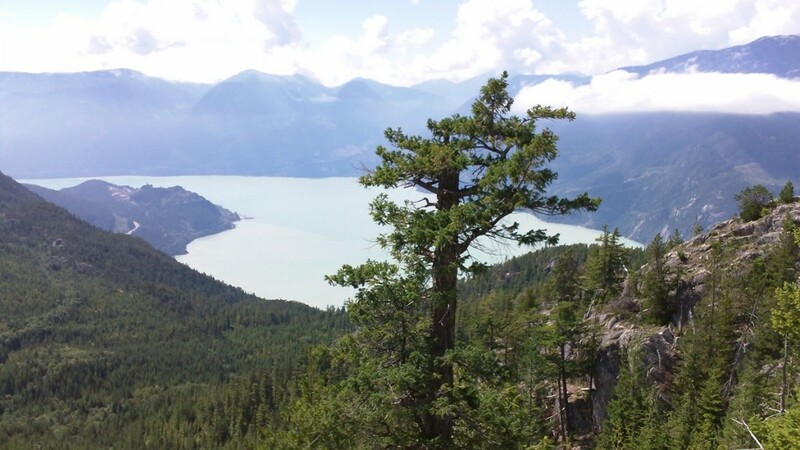 There you’ll find trails and several viewing platforms giving sweeping panoramic views of Howe Sound. One of the platforms gives a view from above the Stawamus Chief, the third part of this triple attraction. The Chief is a popular hiking and mountaineering destination. There is an easily accessible trail to the top of the Chief. But it is a strenuous hike and a challenge if you’re not in good shape.